Injured: Navicular Fracture in his left foot, December 2018. In his short career at Oregon he averaged 21pts, 9.6rbs and 2.7blks on 56/52/76 percentages. Impressive to say the least. 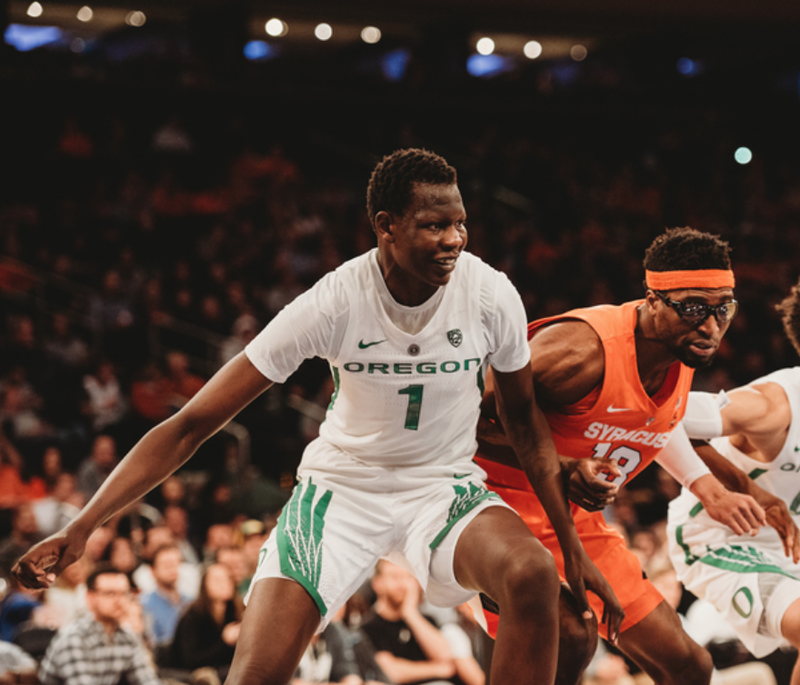 The son of the late Manute, Bol Bol is an insanely long and uniquely gifted player with very intriguing upside. He's filled out his frame a bit over the past few seasons and is looking the part of an NBA lottery pick. The injury may cause him to drop a bit on draft day but if he cans stay healthy he should be a difference maker in the League. Bol Bol has awesome height and length making him a force to be reckoned with in the paint. He should top out at well over 7 feet tall and maybe even reach the 7-7 height of his father Manute Bol. He can change the game on the defensive end, swatting shots and altering every drive into the lane. He shows decent timing as a shot blocker and does a good job of avoiding careless fouls. He does have his weaknesses on D (see below) but he's got defensive upside as well. He has surprising coordination and speed for a lanky youngster, and a developing offensive skill set. He can step out and shoot threes and has a nice release on his shot, which is nearly impossible to block due to his height. He handles the ball very well for a 7-2 player and has some SF skills. He can make plays in the open court, can find teammates off the bounce and can easily pass over defenders thanks to his height. His three point shooting looks like a lethal weapon which could keep him on the court, even if his defense doesn't pan out. If he can continue to grow into his body and refine his skill set, he has a chance to be really, really good. Bol is still rail thin (despite having gotten bigger) and needs to add a lot more muscle to hold his own at the top level. He can get pushed out of the paint too easily and needs to do a better job of establishing and holding position in the lane. He doesn't have great change of direction and kind of lumbers up and down the court. This can be a big problem on defense when he's forced to guard in space. His defensive awareness can be lacking at times and his top effort isn't always there. Does he have the will to be great and a real love of the game? He'll have to play with more fire and intensity to reach his full potential. Will injuries always be an issue? The greatest ability is availability. Needs to develop his post game and not fall in love with the outside shot. Reminds a little of Rik Smits or a poor man's Porzingis.